The Parthenon was the temple for the Goddess Athena. 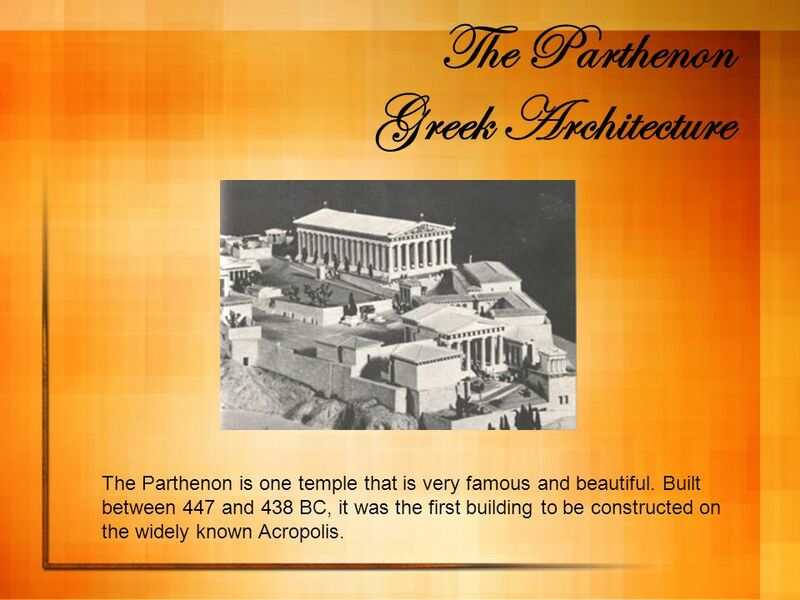 The Parthenon is one temple that is very famous and beautiful. Built between 447 and 438 BC, it was the first building to be constructed on the widely known Acropolis. 2 Sacrificial Altars When talking about Greek temples, there are some things one must keep in mind. First, that Greek religion is not like that of the Christians. The Greeks thought their gods were of the same nature as man, except smarter and stronger. Second, that the temple was the house of the god they worshipped, so it had to be finer than that of man. Third, that congregations of people did not meet in the temples to worship, as if it were a church. 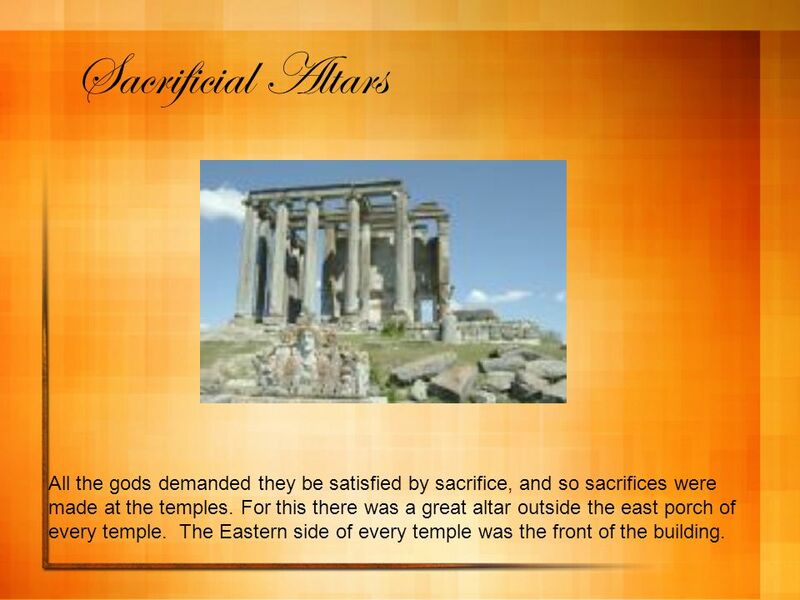 And last, that all the gods demanded they be satisfied by sacrifice, and so sacrifices were made at the temples. For this there was a great altar outside the east porch of every temple. All the gods demanded they be satisfied by sacrifice, and so sacrifices were made at the temples. For this there was a great altar outside the east porch of every temple. The Eastern side of every temple was the front of the building. 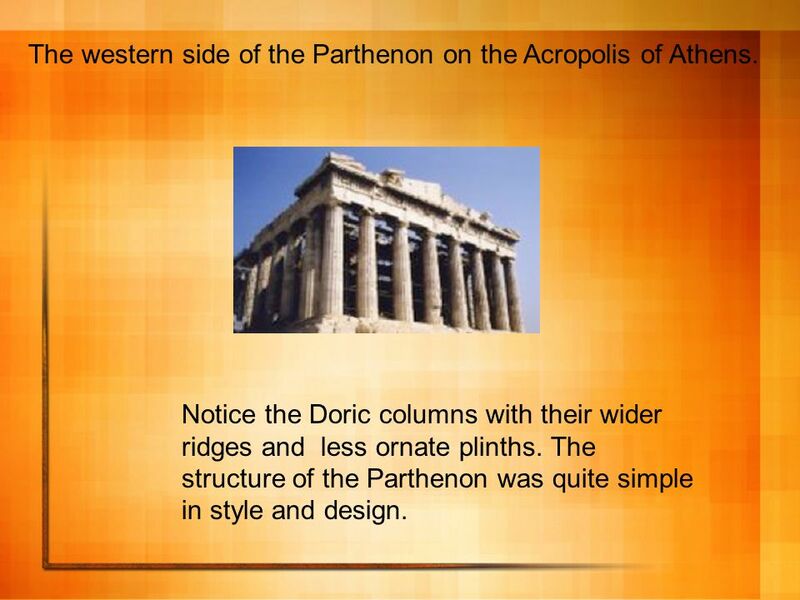 The Parthenon was a Doric temple with Ionic features. It was used as both a place of worship and a treasury. . These three styles were called orders in architecture. They called them orders because the columns were in order of the least to the most ornate. The base of the Doric column is also the most simple as it stands on the floor, the other types have a separate piece at the base. The separation of the frieze into metopes and triglyphs is also typical of the doric order. In other orders the frieze may have been covered by continuous reliefs uninterrupted by the triglyphs. The Parthenon is recognisably Greek because of the huge columns which surround its walls and separate sections inside the temple. 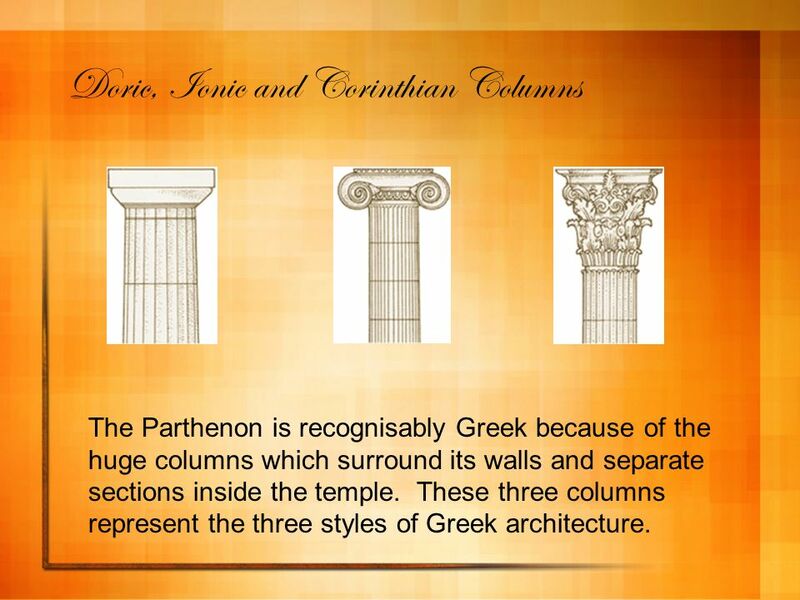 These three columns represent the three styles of Greek architecture. 4 The western side of the Parthenon on the Acropolis of Athens. Ionic columns were used inside the temple Notice the Doric columns with their wider ridges and less ornate plinths. 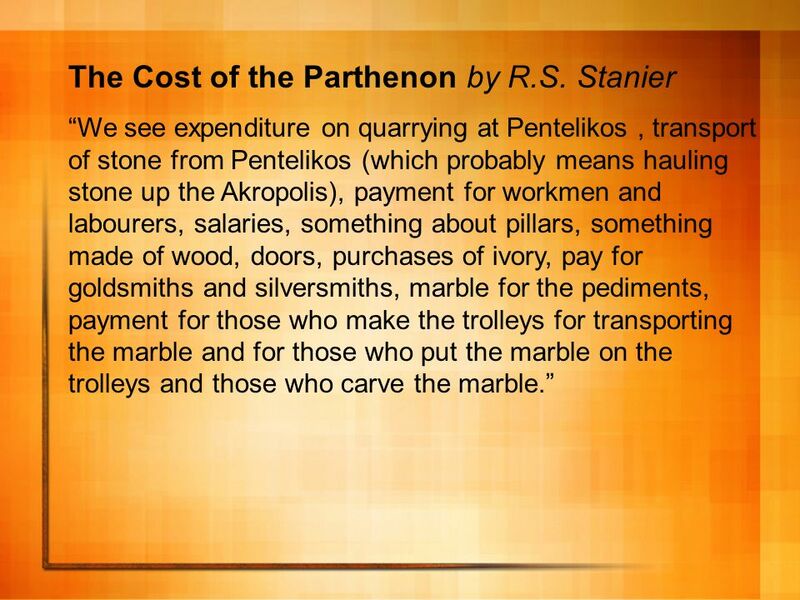 The structure of the Parthenon was quite simple in style and design. 1.Parthenon2.Old Temple of Athena3.Erechtheum4.Statue of Athena Promachos5.Propylaea6.Temple of Athena Nike7.Eleusinion8.Sanctuary of Artemis Brauronia or Brauroneion9.Chalkotheke10.Pandroseion11.Arrephorion12.Altar of Athena13.Sanctuary of Zeus Polieus14.Sanctuary of Pandion15.Odeon of Herodes Atticus16.Stoa of Eumenes17.Sanctuary of Asclepius or Asclepieion18.Theatre of Dionysus Eleuthereus19.Odeon of Pericles20.Temenos of Dionysus Eleuthereus21.Aglaureion The Acropolis of Athens is the best known in the world . 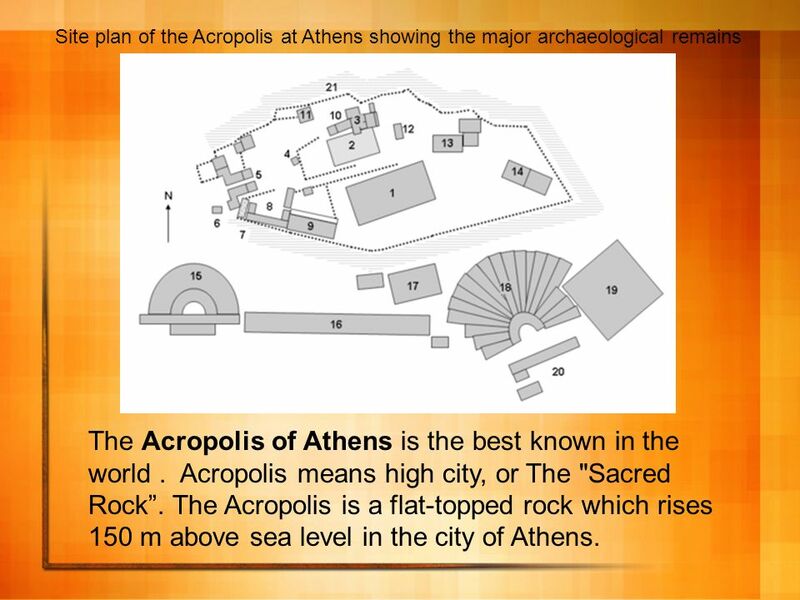 Acropolis means high city, or The "Sacred Rock”. The Acropolis is a flat-topped rock which rises 150 m above sea level in the city of Athens. 6 Metopes and Sculpture The Metopes of the Parthenon are a series of 92 marble panels running along the outside walls of the Parthenon. Notice how detailed the sculptures are. They were carved all the way around to the back so that the shoulders, backs and legs of their subjects stood out from the building, notice how the mans knee in this sculpture actually is completely free from the wall. The carvings were incredibly intricate. Some art historians wonder at their intricacy and the additions even of such elaborations as tiny bronze pins in the carved shawls worn by the women, as once the sculptures were on the very top of the Parthenon there’s no way you would be able to see these things. The Parthenon metopes that were visible on the exterior of the temple were made in deep relief and surrounded the temple on all sides. 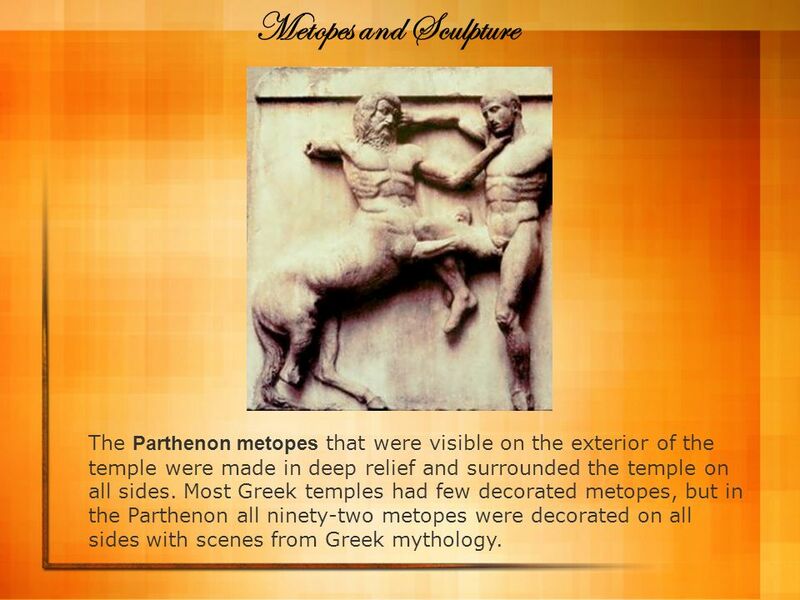 Most Greek temples had few decorated metopes, but in the Parthenon all ninety-two metopes were decorated on all sides with scenes from Greek mythology. Traces have been found of the colors red and black as well as blue paint which came from Malachi quarried at the tip of Attica. Metal was also used to add detail to sculptures. The mane of one horses head has 33 holes in it which would have been originally held bronze or silver attachments. 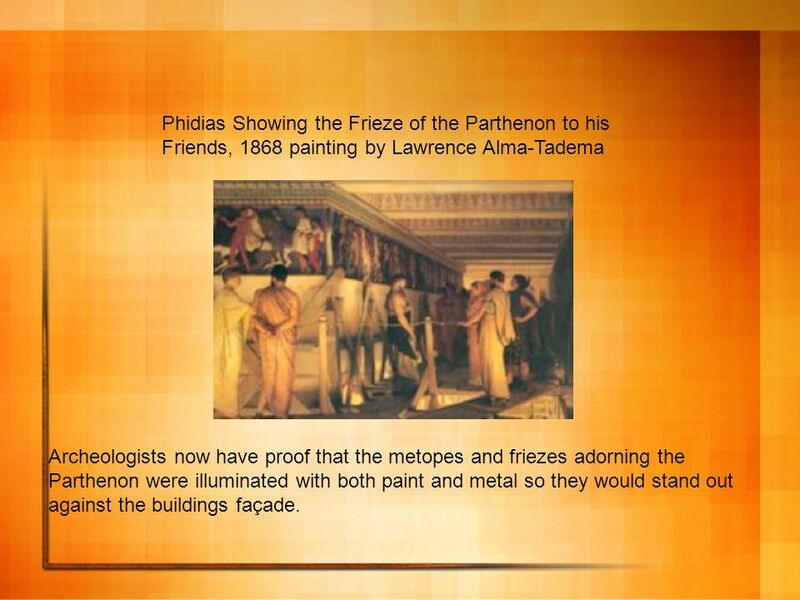 Archeologists now have proof that the metopes and friezes adorning the Parthenon were illuminated with both paint and metal so they would stand out against the buildings façade. 8 The sculptures of the Greek gods were deliberately damaged first by the Christians who took over the temple. They believed that these examples of idolatry and so they took hammer and axes and literally hacked the heads and other offending parts off the sculptures. Archaeologists believe that the metal attachments would have been the first things ripped from the walls of the Parthenon as they could be reformed into weaponry. 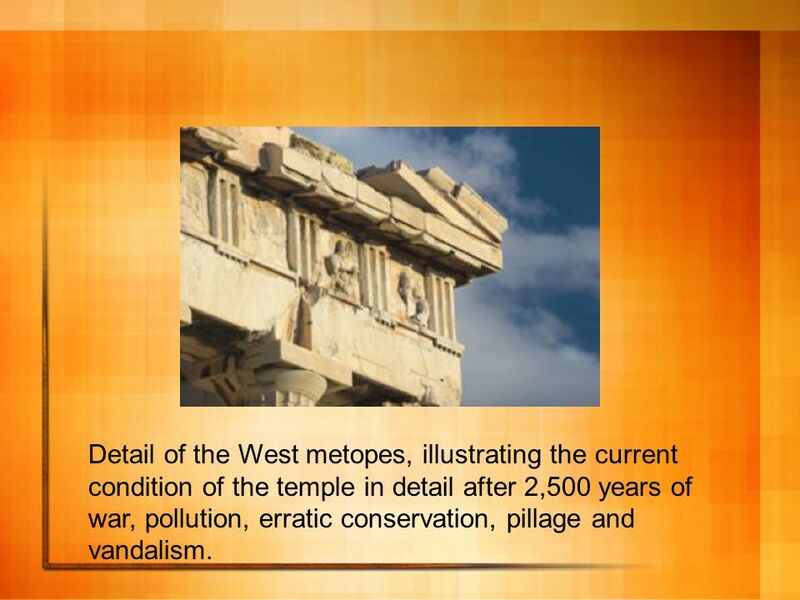 Detail of the West metopes, illustrating the current condition of the temple in detail after 2,500 years of war, pollution, erratic conservation, pillage and vandalism. 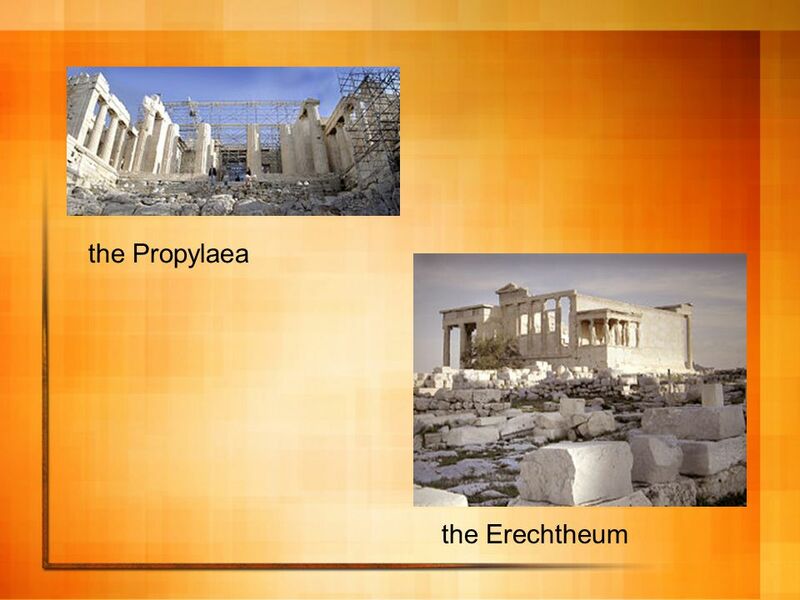 Download ppt "The Parthenon Greek Architecture"
The Acropolis The Acropolis was a religious shrine and fortress. Acropolis means “high city”. This flat limestone rock was very special to the Athenians. Ciro desmiconra juan. templ e of Zeus The temples were built with three types of columns Doric columns, Ionic columns and corinthian columns. Desmi. A Step Back In Time Ancient Greece Architecture Art, method and style of building. Greece’s Golden and Hellenistic ages Ch 6 section 1 Greek art of the golden age. TEMPLE OF ATHENA NIKE. The temple sat on a high outcrop of rock. A whole class teaching tool created by Paul Turner, Round Diamond School. CLASSICAL ARCHITECTURE. A style of architecture begun in Greece after the Persian Wars (400’s BC) This style of architecture spread through the known. Classical Greek Architecture and architectural sculpture. Ancient Greek Architecture Architecture I Fairport High School Technology Department Mr. Bussani. 1. Doric column Ionic column 3. Doric column with fluting. Greek Art of the Golden Age Pg.1 Greek Art of the Golden Age Pg.1 In 400 B.C. Greece entered a new era of cultural progress called the Golden Age of Greek. Greece III. Architecture A. Columns a. Columns are part of Post and Lintel type construction.